The green material got me thinking about sunflowers! And so I got busy trying to play catch up with my brain!!! Out came the black dishes, the new black cloth napkins, the sunflowers, and for a change the stemware aquired on a cruise taken long long ago with my parents! 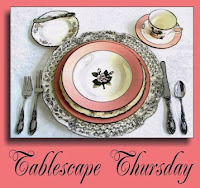 And before I knew what was happening, the tablescape for this weeks Tablescape Thursday entry was nearly complete! Just missing the final touch....and thanks to my cricut, I was able to create that final touch! the yellow charges come from IKEA, for that matter so do the black plates! Will the cat, looks on from afar! one can do so much with colored sand! the glasses come from a NCL Cruise we took with my parents! I hope this Thursday finds you healthy and happy! See you all real soon. Perhaps this Sunday here at An American in Berlin for New Recipe Sunday?